While traveling home from work, Beaulne bought a Lotto Max ticket from the R & R Petroleum on Hillside Drive in Elliot Lake. But it was a couple of days before he got around to checking his ticket. And when he scanned the ticket, the words “big winner” appeared along with a number containing a lot of zeros. 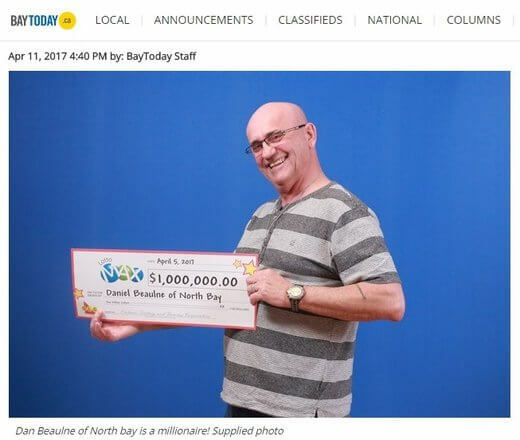 At first he thought it was just $10,000, so the clerk had to correct him saying he really won a million. At this point Beaulne was overcome by emotion and returned to his car where he bawled like a baby. Then he got around to calling his wife with the good news. The winner, a newlywed, says he and his wife will build a home with his windfall. Other than that they plan to visit two children, one in Africa and another in the Dominican Republic, whom they sponsor. He plans to ensure the two children’s educations are provided for.